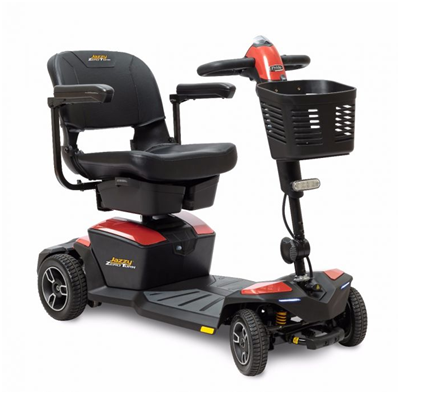 Get a 4-wheel scooter with a 3-wheel turning radius with the Jazzy® Zero Turn and Pride’s exclusive patent-pending, Zero Turn technology.Navigate tight corners and small spaces effortlessly with a 38” turning radius. Illuminate your ride with bright LED lighting. Dual motors and CTS suspension ensure a smooth and comfortable drive. Veo Sport – FULL SUSPENSION!